What would my newly declared swimsuit week be without a swimsuit giveaway. Here's a chance to win your own "fatkini." One lucky reader will win my swimsuit combination. Here's how to enter. 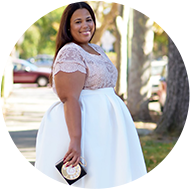 All entrants must be followers of The Curvy Girl's Guide to Style via Google Friend Connect. Contestants can enter up to 4 ways. Minimally, contestants must like the GarnerStyle Fan Page and comment their email address & "Enter Me." You can get two additional entries by following the www.twitter.com/garnerstyle twitter page and tweeting "I just entered @garnerstyle Plus Size Bikini My Way Giveaway at www.garnerstyle.blogspot.com" All of this is be done through the Rafflecopter Widget below. Entries will be taken until 5/18. Want to view the details of the item you could possibly win. See the bikini top here & the bikini bottoms here. Good Luck to all! tiffany.cadogan@gmail.com...you looked amazing by the way! This is perfect for my upcoming island trip. (mssucculent1@gmail.com) love how u rocked it!!!!! You look absolutely gorgeous.... Love love LOVE it!!!! Lovin' the Fatkini....I hope I can rock it just like you!!!!! This is so exciting. Thank you for the opportunity! I was JUST lusting over these bathing suits yesterday! Your bikini look was fabulous. I would rock every inch of it! ENTER ME! This would be PERFECT for my 7 day cruise or just the Summertime PERIOD...OMG! I leave for vacation this Saturday and I will be rocking my fatkinis for 9 days straight!!!! I would <3 to rock this in" JAMAICA"!!! The bikini is great but your skirt is fab!!! I never wear a bathing suit just shorts, i would love to win this its so fabulous! Love this look! Enter me! cathy4cc@gmail.com - such a great giveaway!! You are beautiful and a true CLASSY inspiration to young lady's like myself !!! Im soo glad they came out with the "fatkini", greatest thing since sliced bread!! lol but really! just bc im plus sized doesnt mean i want to wear a sheet in the pool/beach! I..soo love your fashion sense! Only need the confidence to rock it like you! Vandella Costumes has been creating posing suits in the fitness industry for 10+ years, and her suits speak for themselves.